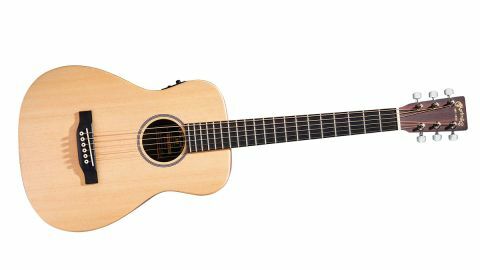 The Martin LX1E feels a bit utilitarian but packs a very endearing and classic steel-string punch, both acoustically and amplified. Business class by design – simple, but everything you need. Some may find it a bit austere, but it functions perfectly. A hugely tidy build, the LX1E is again unbound and the top's chamfered edge creates a rather thick-looking impression that looks a little unfinished against the Taylor Mini-E.
Conversely, the multi-piece neck feels more finished and less open-pored and the fret work and rounded fingerboard edges give a great feel. The material may be man-made, but the fingerboard and bridge look like dense ebony, while the dark-hued HPL back and sides ape a dark, rich mahogany with the back's central core material giving a dark binding line, which evokes a classy feel. This one has a conventionally braced back and - with less decoration, no position markers to the fingerboard face and just a single five-band rosette - does look a little austere. The Little Martin does feel a little industrial, but from the first strum its more conventional spruce-top voice has us captivated. If you're a classic Martin fan, this is just miniaturised with a lovely crisp-edged voice. Its conventional sound perhaps leads us to traditional 'American' fingerstyle, and its pushy voice would certainly be heard above bigger guitars, both in an ensemble or a recording. Serious fun. Our Martin has only pre-set EQ, and without that engaged things are a little middly and boxy: it definitely sounds more conventional with the contour switch, which cleans up the mids a little and adds some crispness. Like its acoustic voice, the Martin sounds very 'conventional' plugged in and that's no bad thing. It does sound a little more 'piezo-y' than the Taylor, especially on higher position lead lines, but it's really easy to dial in: we scooped a little lower midrange and that was about it. Open-mic ready, we'd say!